⚠️ Only MySQL and PostgreSQL Database connections are supported. Adding another database only requires additional repository interface implementations following the examples of MysqlTranslatorRepository.php or PostgresTranslatorRepository.php. Detailed information is now in the wiki. For Laravel 5.6 require: "vsch/laravel-translation-manager": "~2.6"
For Laravel 5.5 require: "vsch/laravel-translation-manager": "~2.5"
For Laravel 5.4 require: "vsch/laravel-translation-manager": "~2.4"
For Laravel 5.3 require: "vsch/laravel-translation-manager": "~2.3"
For Laravel 5.2 require: "vsch/laravel-translation-manager": "~2.1"
Laravel version 4.2 is no longer supported. You can still get access to the last updated version. 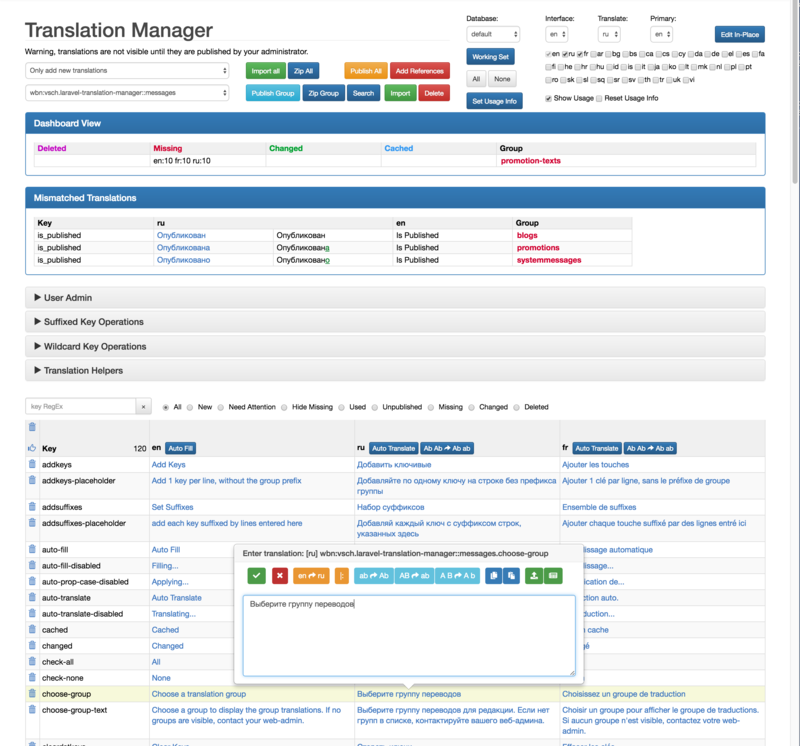 Use the laravel4 branch, or require: "vsch/laravel-translation-manager": "~1.0"
❗️ If you have made correction to the auto-translated localization and would like to share them with others please do so. It will be greatly appreciated. React UI added as an option to WebUI. Laravel 5.4 compatible release. No API changes only internal implementation changes. Now using Laravel 5 authorization API to handle all LTM related authorizations. By default this option is turned off and any user who does not have ltm-admin-translations ability can modify any locale. With user_locales_enabled option enabled you can control which locales a user is allowed to modify. Default for all users is all locales, unless you specifically change that through the web UI, see User Admin or by populating the ltm_user_locales table appropriately. * This package was originally based on Barry vd. Heuvel's excellent barryvdh package.